December 7 carries a big burden. President Roosevelt had it right: this date lives in infamy. For Americans it will always be associated with the horrific Japanese attack on Pearl Harbor in 1941. Every year on this day solemn ceremonies honor the lives lost and the irreversible descent into World War II. 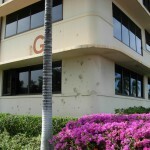 The hard-hit Pacific Fleet base at Pearl Harbor carries the banner, although the Japanese also targeted numerous other military installations on Oahu and across the Pacific, including Wake Island. Infamy is a loaded word: it conjures up a condition of detestable evil and the righteous outrage that stands steadfastly against it, in this case, wrapped in the flag. Over time infamy acquires an almost impenetrable shell that repels the probes of reconsideration. In December 1941 war was clearly looming on the western horizon, but the United States had made a firm commitment to a Europe-first strategy when it entered the war. For a number of reasons the Roosevelt Administration waited for Japan to take the first shot to justify the nation’s entry into the war, and fully expected that the first shot would come somewhere in the Far East. “Not fair!” Americans cried then, and reaffirm year after year. 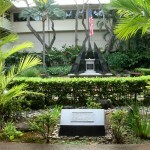 I was honored to stay on base at Joint Base Pearl Harbor-Hickam before and after my trip to Wake Island in 2011. It was the week before the seventieth anniversary of December 7, 1941. The day before the flight to Wake I joined a couple of members of the 611th Air Support Group to visit the public Pearl Harbor Memorial site, including a trip out to the USS Arizona Memorial, which more than a million visitors take every year. Despite the jostling crowds the Arizona was deeply moving. 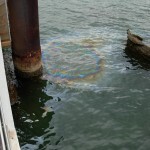 To me the pulsing sheen of oil on the water above the sunken, slowly-leaking battleship was most evocative. Looking across to the woods on Ford Island, I had a hard time imagining Pearl Harbor as it would have looked seventy years earlier. Later on base we walked around the grounds of the harbor. Impressive as it was, I didn’t have a sense of the immediacy of infamy, just a busy and bustling navy base. Well said! I think you’ll find the book “A Date Which Will Live” by Emily Rosenburg pretty interesting. The memory of Pearl Harbor is so prominent in the United States and their are so many different forms the memory has been used. Not to mention for us Wake Island folks, December 7th brings a whole different feeling and memory. Good work Bonnie! Thomas, thanks for bringing up Rosenberg’s book. She makes a compelling argument about the ways in which public discourse and media reinforce certain aspects of our national memory – what she calls history/memory. Imagery of “Custer’s Last Stand” and “Remember the Alamo” shaped and still shape the public memory of Pearl Harbor (and Wake Island). Treachery and infamy, words repeated again and again in the same breath as Pearl Harbor, justified righteous vengeance then and now – a knee-jerk reaction that negates an honest evaluation of context. The simplistic theme of good vs. evil was employed by governments, print media, and filmmakers (such as Germany’s Hippler, America’s Capra), on all sides in WWII to motivate military trainees and for public support of the war; we need to evaluate why we feel compelled to perpetuate the myth seventy years later.